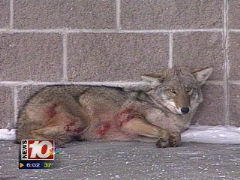 As a wildlife professional I was sickened by the treatment the injured coyote at the Macedon plaza received from Rochester, NY animal control , police and of course, the hunters themselves. I was also disappointed with the news report and sensationalism that made it seem as though coyotes are dangerous and a problem. Even worse, I am sickened by the coyote hunting that is allowed to go on. This hunting and killing is creating the very problems that the hunters claim to be trying to solve. To make things worse, the coyote was dragged with a noose across the parking lot and thrown into a cage on the back of the hunters truck, then taken out later and shot or “euthanized” as the press wrote. what a horrible, tragic death for this animal that has done no wrong. The only thing that will control coyote populations is less available food. Less food means less coyotes, it is a very simple concept- and it is free and requires no killing. History and numerous biological studies have proven over and over again that trying to control coyote populations by killing them is like trying to put out a fire with kerosene. The more coyotes that are killed, the more females produce pups that year, and they have larger their litters. These pups have a larger percentage of survivability. Larger litters need larger prey to feed them – deer hunters, are you listening? Don’t let the coyote hunters fool you – they are not doing you any favors- They are the ones creating this problem by hunting and killing coyotes- and for fun no less. Are there too many deer or not enough deer? Hunters can’t seem to make up their minds. My guess is, depending on whether the hunter gets his tags filled or not becomes the determination. If there are too many deer in a “green space” area, then what is the problem with coyotes being there to naturally thin the population? Society can easily watch a deer being shot, or hit by a car, but can’t stand to see one being taken down by a natural predator? The coyotes are here because there is a lot of food. When the food availability goes down, the coyote population will go down naturally with it and we will have Peace and Harmony once again- but we must allow it to happen naturally, without getting involved or it becomes a disaster.